First let me say this, Power of Metal did not obtain this album for reviewing. This is my own personal album and we felt it needed to be put up for the entire world to see. The feeling I get from Hand of Justice is hard to put into words but I will try. Every now and then you stumble across something that just blows away everything else you have been listening too. Well that is the case with Witchking’s second album Hand of Justice. 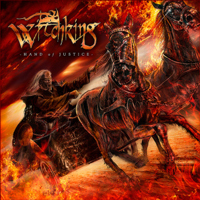 Out on Insanity Records from Poland, where Witchking reside as well. The thing that makes this album so damn good is its straight ahead pure Heavy Metal approach. Think classic Metal Church, Annihilator or Vicious Rumors and that’s a little of what you can expect. The guitar work is top notch from Hardo & Gajdek, from heavy chunky riffs to ear piercing solos. The very impressive vocals of Tom “The Storm” is the big thing for me on Hand Of Justice. Very good mid range and can hit them high notes with ease. Reminds me of Midnight from Crimson Glory in parts. But not as high. All this would not be at all possible if it was not for the engine room of Sado (Bass) & Banan (Drums) that keep the machine galloping along at a nice speed. Neck breaking at times, especially on M Impact WOOHOOO!!!!!! I can’t recommend Hand of Justice enough; there are 10 tracks of pure energy with no filler. No one track stands out because they are all so bloody good. The album artwork is even old school. “Love It” This is how I use to feel 20 years ago when I would race into my room and put on the latest record I just brought not knowing what to expect J If you are after some traditional pure Heavy Metal but with today’s technology production and a fresh sound. Then you MUST go and buy this today. Spread the word brothers of Metal. Check out their website for further information.